1. Get the heck outta there. That's pretty much it for the "Do" list. The "Don't" list is longer and includes several potential dangers related to a failed roof. These are certainly worth mentioning because you, like any homeowner in this situation, might be tempted to do something stupid. The main thing not to do is go back into the house. A roof collapse is a serious structural failure that can affect many other parts of the home's structural system. For example, the roof frame ties the walls together. If snow loads are big enough to crush a roof, they can topple walls like a card house. Even after things have quieted down, there's no way of knowing what other structural elements have been compromised or are under stress until the house has been examined by an engineer or other qualified expert. The other big reason not to be in—or even too near—the house is the great potential for leaks from broken gas lines and dangers from damaged wiring and other electrical elements. And don't forget that the roof is also where some critical plumbing runs terminate; namely, exhaust flues from gas-burning appliances and vent pipes from your home's drain system. Any of these runs would likely be damaged or blocked by a cave-in, possibly resulting in poisonous gases or nasty sewer air being released into the house. All of the above explains why you need to call 9-1-1. The gas and electricity need to be shut off immediately, and the house must be inspected by a professional to assess the situation and recommend the next steps. Imagine the sound in the hull of an old wooden cargo ship, creaking and moaning as it labors through the waves...If you hear anything like that coming from your roof, you might be in for an indoor avalanche. Other signs include bowed or cracked roof framing members and doors and windows failing to open or close normally. In areas that get a reasonable amount of snowfall, roofs are commonly designed to hold 30 pounds of snow per square foot of roof. This is called the "live load" and includes the snow plus anything else that might be on your roof, such as yourself and your 10,000-watt Santa-and-reindeer display. The "dead load" is the roof itself. So how much snow is 30 pounds per square foot? It could be a depth of up to 10 feet with very dry, fresh snow and as little as 1.5 feet with very wet snow. The only way to prevent a roof collapse is to lighten the load by shoveling off some of the snow. For a DIYer, this is best done with a snow rake designed for roofs. You can use these from the ground—a much better idea than getting up onto the roof!—and they're less likely to damage your roofing than conventional tools. Remove the snow in a careful, systematic manner, taking off a little at a time from each side or plane of the roof so as not to create an imbalanced load that can further stress the structure. 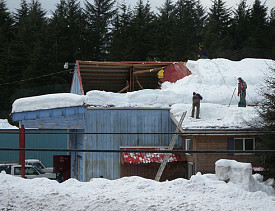 If you'd prefer not to tackle this tricky task yourself, hire a reliable pro to safely remove snow from your roof.